Home News Musquin’s ugly heat race crash! Musquin’s ugly heat race crash! 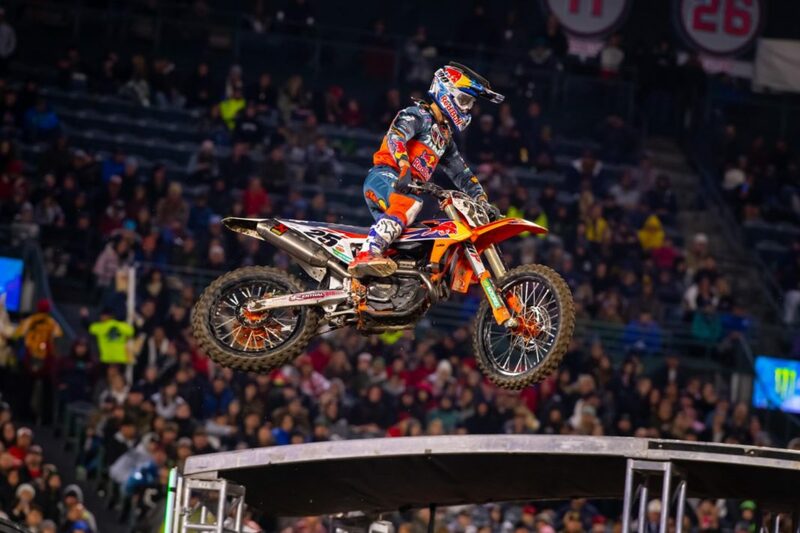 It was a tough day for Marvin Musquin at Nashville. The Frenchman was leading his heat race when the red flag came out, then while chasing Cooper Webb in the restart, he went down hard in whoops – and was lucky to get up uninjured. It was a case of Deja Vu in the main when Musquin got the other set of whoops wrong and went down again while second and chasing Webb, forcing Musqin to charge from the back of the pack to 6th. But it all leaves him 21 points behind Webb with three rounds to go – and tied for second with Eli Tomac. “Qualifying eighth in the heat race kind of put me in a bad position for the Main Event but I was able to get a decent start in second. Unfortunately, I made another mistake in the first set of whoops and I went down. From last, I came all the way back to sixth-place, which is okay but the end result is not good so we’ll keep on fighting,” commnented Musquin.